The Southwest is one of the most exciting wine regions in France, with fantastic appellations using indigenous grapes to make some superb wines. There are two opportunities for Scottish wine lovers to attend Southwest French wine events hosted by Tom Cannavan this autumn: in Glasgow on 16th September a masterclass is being presented to the Institute of Wines and Spirits Scotland. Eight wines will be used to illustrate the diversity and quality of the region. The institute runs its events for members, but guests are welcome at a cost of £20 per event. Contact president@iwss.org.uk. Then in Edinburgh on 16th October there’s an extraordinary dinner at Café St Honoré where award-winning chef Neil Forbes has designed a four course dinner, which Tom has matched to 12 Southwest wines, which he will present on the evening. The cost is just £40 per person. Book on 0131 226 2211. That’s the Champagne & Sparkling Wine World Championships 2014 to you and me, the full results of which were exclusively premiered on wine-pages last month. However announcement of the trophies was delayed until last week, and the news is that Champagne Louis Roederer Cristal Rosé 2002 scooped the ultimate prize as Supreme World Champion. The other 12 World Champion wines by origin are Blue Pyrenees Estate 2010 Midnight Cuvée (Australia), Brundlmayer 2008 Brut (Austria), Roederer Estate NV Brut Sparkling Wine (USA), Graham Beck Wines 2009 Blanc de Blancs (Cap Classique), Gramona 2000 Enoteca Brut Nature (Cava), Miguel Torres Chile NV Cordillera Brut (Chile), Digby Fine English 2009 Réserve Brut (England), Il Mosnel 2008 Rosé Pas Dosé Parosé (Franciacorta), Akarua 2010 Vintage Brut (New Zealand), Nino Franco 2013 Valdobbiadene Primo Franco (Prosecco) and Ferrari 2007 Perlé (Trentodoc). Full results in the current issue of World of Fine Wine magazine. Wine? Ce Qui Est du ‘Wine’? 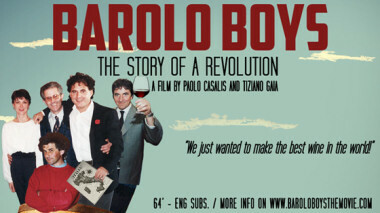 Yet another wine-themed movie, this one telling the story of how in the 80s and 90s a group of producers from the Langhe in Italy “dramatically changed the world of wine.” Barolo Boys “chronicles the ‘revolution’ that made Barolo wine gain its much deserved notoriety,” apparently, and whilst we at wine-pages towers are not certain just how notorious Barolo actually is, the film looks interesting. ‘Starring’ Elio Altare, Chiara Boschis, Marco de Grazia, Giorgio Rivetti and Roberto Voerzio amongst others, it is on a tour of cinemas and film festivals in Italy and the USA, but you can also stream it or buy it on DVD from the website baroloboysthemovie.com.